I'm unsure of how your stuff wires together but if the photo eyes aren't really letting enough power pass through the contacts to the pump then install an ice cube relay in between the two. 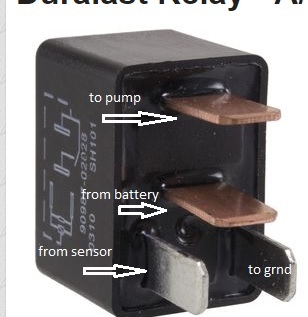 The photo eyes energize the coil on the relay and then the relay lets the power pass straight through to the pump. Is everything a 120 volt or 12 volt dc circuit? A solenoid of some sort should do the job. You would also need the relay socket that is shown as accessories on the right side to land your wires on. The specs shows the relay contacts are good for 10 amps so make sure your pump doesn't pull any more than that and your golden. You'll probably have to order that online also being 6 volt. A starter solenoid for a lawn tractor or Ford 8n tractor should work. Cheap, readily available, and cheap/easy to replace. TSC has them for about $12. For that matter, any relay off a 12v car would probably work better with even less current draw, especially the ones that engages the electric radiator fan, A/C compressor or the fuel pump relay. Starter solenoids generally draw 8-10amps for the coil to initially plunge the core down, but require a lot less to hold it down. The other relays I mentioned draw about 1/2 that or less. "To pump" would be carrying the positive voltage..you would need to independently ground the pump. I bought 2 sensors with the reflectors, kinda like the sensors on a garage door, I had May electric get them for me he and I work on a lot of jobs together. He wired it up for me, put a automotive relay on like GB mentioned. I know nothing about electric after it gets away from a welding lead. Aren’t you in Hancock co if so you’re more than welcome to look at mine.